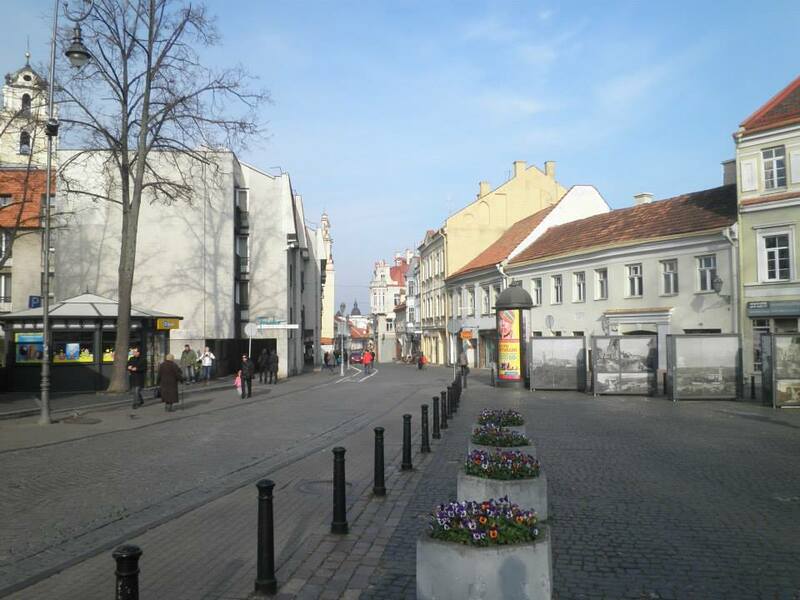 Vilnius, capital of Lithuania, is a city with an eventful past. During the late Middle Ages, the city went through a period of rapid development, attracting a diverse amount of migrants. This influx contributed to the multi-cultural character of the city, which is dominated by Baroque buildings, but where one can also find Gothic, Renaissance and Classical architecture. From the 17th century onwards, the city has been under siege many times, by respectively the Swedes, the Polish, the Germans and the Russians. During the Soviet era, which lasted from 1944 to 1990, the historical city centre went further into decay. After the independence of Lithuania however, many of the old buildings got renovated, and the historical experience of the centre today is apparently authentic enough to be and remain to be (unlike Dresden/ the Elbe Valley) on UNESCO’s World Heritage list. In order to achieve growth of the number of tourist visitors, it is no wonder that city-branding campaigns are focusing on this historical and diverse legacy, as well as on the many green spaces the city has. Based on my own experiences, I can indeed recommend Vilnius as a city trip destination for those who are interested in history and historical architecture. However, in this article, I will recommend Vilnius for a different reason, one on which less attention is spent in the average tourist guide. As soon as you walk out of the formerly walled historical centre, you are namely likely to spot something abandoned. Although I am aware of the fact that this does not necessarily sound appealing to everyone, I know that there are many others (often professional photographers, so-called ‘urban explorers’) with me who share my almost childlike curiosity and fascination, which makes that abandoned sites often have a magnetic effect on me. Abandoned buildings have something mysterious and hence exciting, and can feel like a time-travel machine as soon as you go in. Let me take you to three different derelict sites that form an interesting contrast with the well-preserved medieval centre of this peaceful Baltic city. The first abandoned spot we discovered coincidentally while climbing – alongside many other tourists – was Gediminas Hill, which counts as one of the main sights of the city. While most people were taking pictures of the panoramic view on Vilnius’ old town, we got immediately distracted by a giant deteriorated sports terrain lying right behind the hill, on the other side of the river Neris. 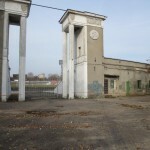 The complex once consisted of a an outdoor swimming pool, the remarkably designed ‘Vilnius Palace of Concerts and Sports’, in which many basketball matches have been played, and the Žalgiris Stadium, in which the Lithuanian national football team used to play for 15,000 spectators. 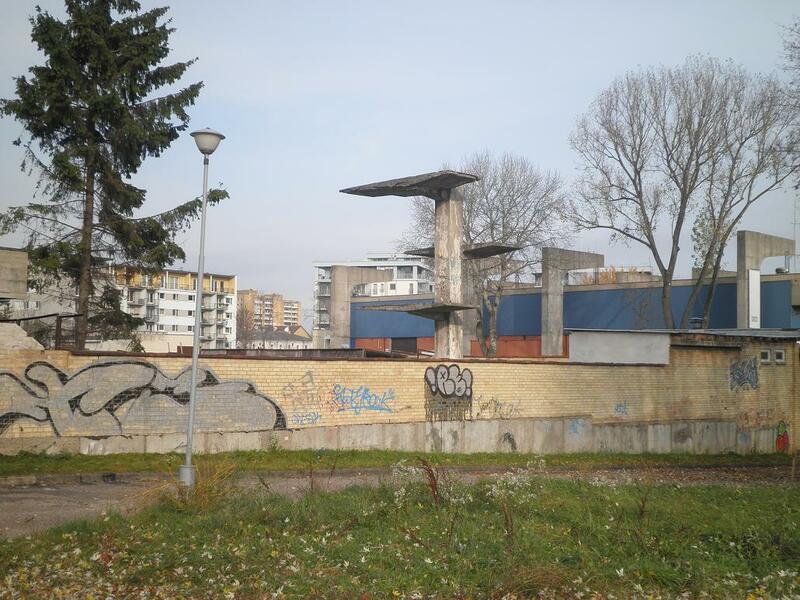 Today, it is not advisable to jump off one of the diving boards (see picture), as you would probably break your neck. 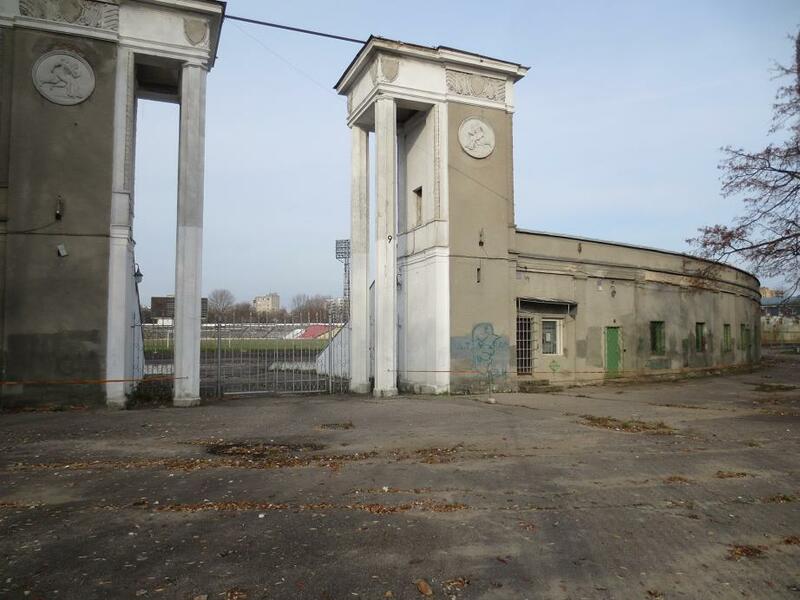 The football stadium is currently on the nomination to be demolished, but could be saved on the basis of being regarded as cultural heritage. 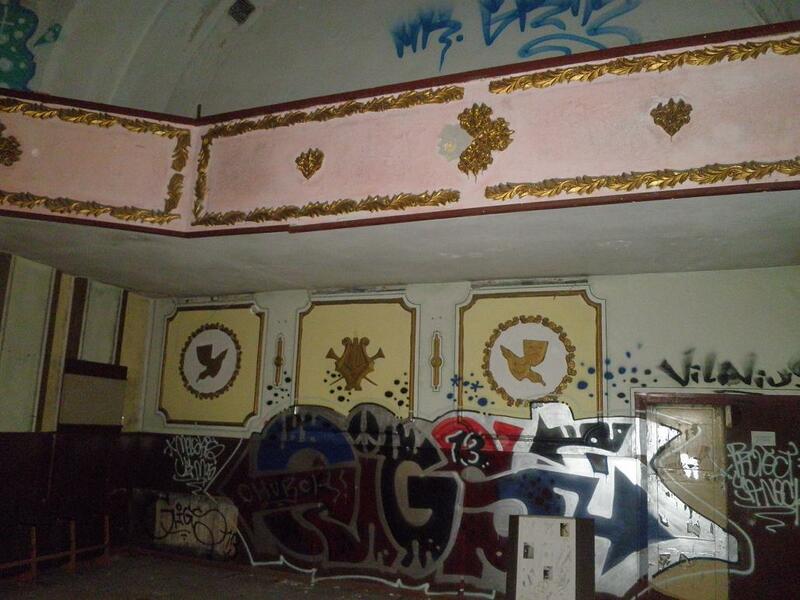 This does also count for the Palace of Concerts and Sports, which is still awaiting a renovation plan. In the meantime, every once in a while cultural events tend to take place in it, despite authorities’ warnings of the building being unsafe, for instance in case of a fire. Big basketball games are currently played in the ‘Siemens Arena’, located at the outskirts of the city as part of the 21st century ‘Vilnius Entertainment Park territory’. 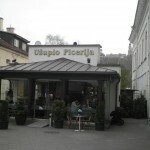 As we move on, we decided to discover the extraordinary neighbourhood known as ‘Uzupio’ or ‘Užupis’. This area, separated from the city centre by the river and on the other side bounded by steep hills, used to be one of the most run-down areas of the city during the Soviet era. 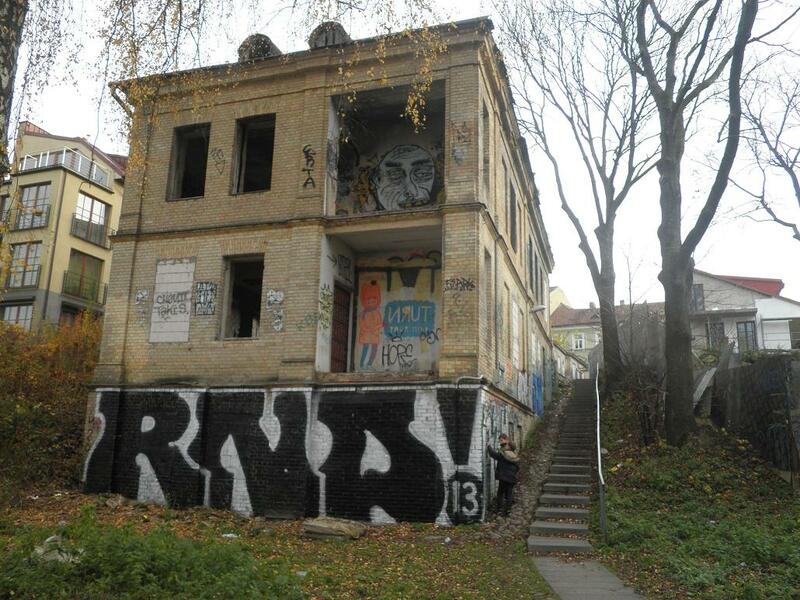 From the 1980s onwards, many artists and bohemians moved into the area, and many of the formerly abandoned buildings got squatted. In 1997, on April Fools’ Day, the republic of Užupis was founded, including its own flag, currency, president, anthem, army and constitution, which consists of 41 rules that are written down on a number of mirrors in a number of different languages. 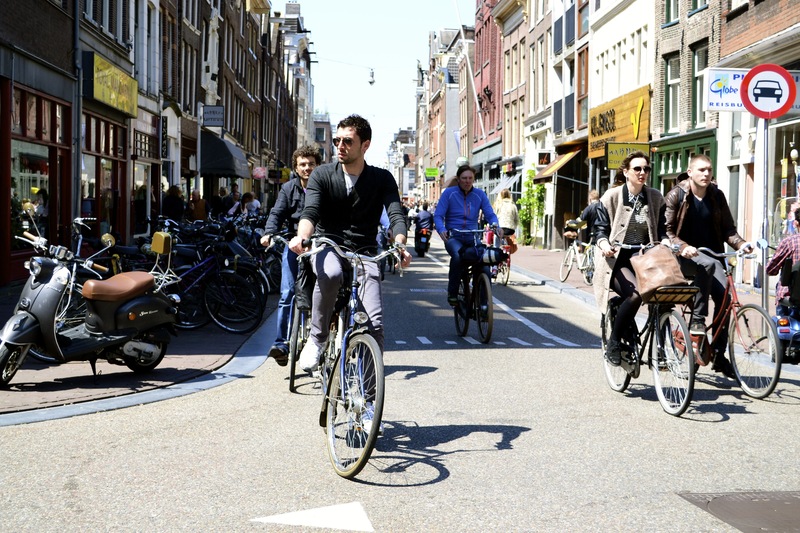 Today, the area shows some indicators of gentrification, including hip (coffee-) bars and hipsterish – van Moof – fixed gear bicycles. 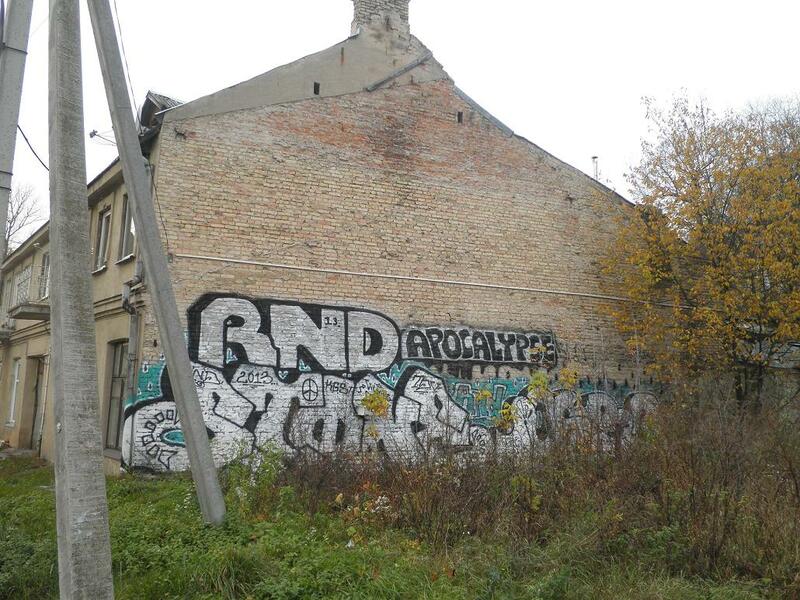 Still, the graffiti-rich empty buildings give the area a sort of a rough and special image. Here, we went into a former textile factory, which, according to the many empty beer cans, has had some nocturnal visitors prior to us. I did not manage to find out whether there are current plans (by the Uzupian ‘policy makers’?) to do something with this empty site. On the way back towards the city centre, the beautiful Baroque ‘Jesus Heart church’, dating from 1765, appeared as a big eye catcher, albeit clearly in a bad state. Not surprisingly, also this building appeared to be abandoned, and since the front door was welcomingly open, we decided to get a glimpse of the inside here as well. 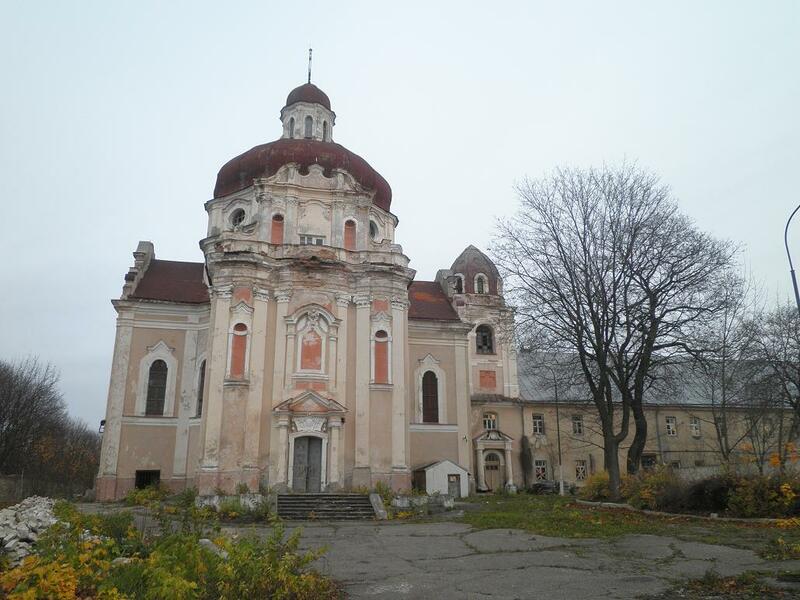 Throughout the years, the church has been converted into an Orthodox one, and closed down and turned into a prison during communist times. Wandering around in this completely stripped-down, former religious building is a bizarre, post-apocalyptic sort of experience. Some objects from bygone times are still to be found inside, including old film-strips, furniture and some books. All this brings us to the question what Vilnius can, and should do with all these derelict sites. 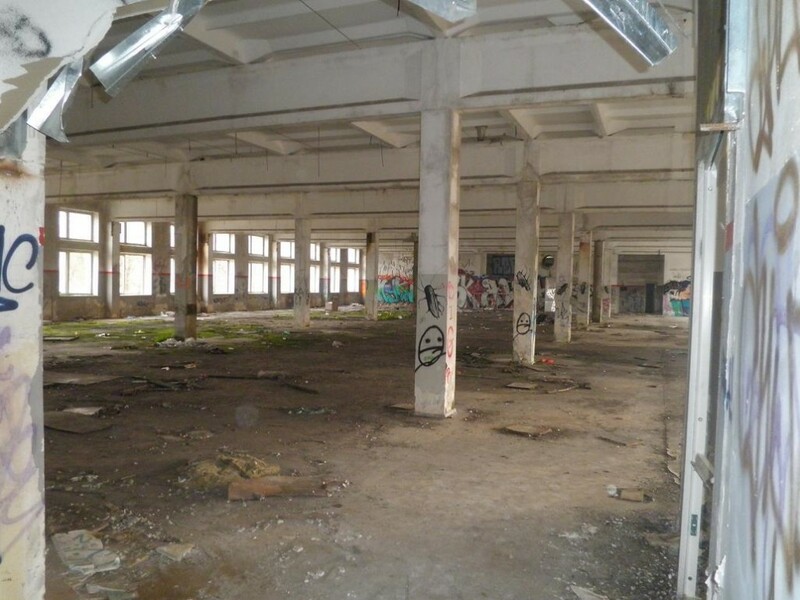 Coming from a country in which abandoned buildings are very rare, often either immediately renovated or demolished, I can imagine people are generally less enthusiastic when they grew up surrounded by abandoned sites and thus regard it as something rather usual. Also, it can negatively contribute to unsafe feelings within public spaces. 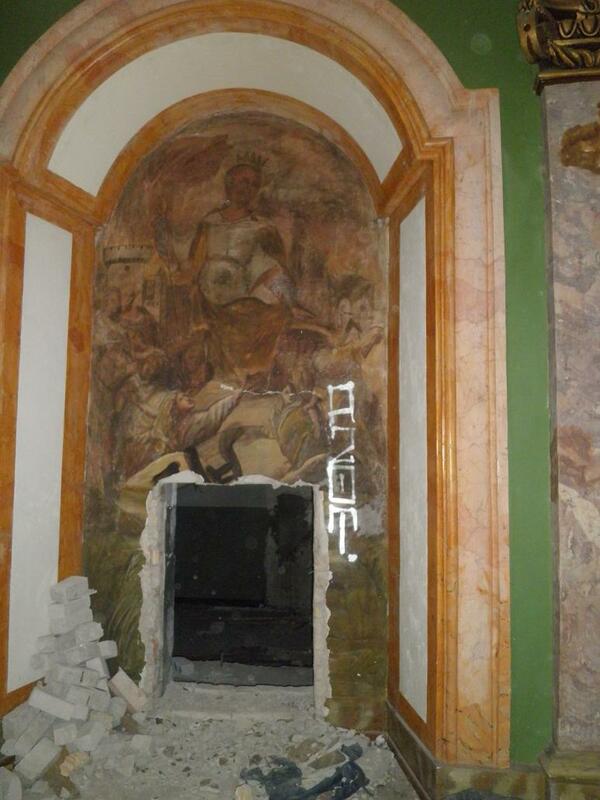 I am sure, however, that cities like Vilnius can also benefit from its abandoned historical buildings. 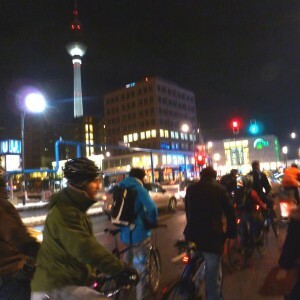 Thereby, I am thinking about setting up specific ‘urban exploration’ city tours or turning some buildings into cultural exposition centres as Tacheles in Berlin used to be for 22 years, in order to put the city on the European map as an alternative, artistic city. This will then probably attract a young and adventurous crowd, and perhaps boost the further development of a contemporarily widely desired ‘creative class’. This is something which the European Capital of Culture Event in 2009 seemingly failed to achieve. 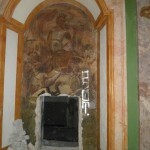 Eventually, revenues can perhaps be used to selectively renovate some of the decay. Realistic photos that tell about Vilnius city more than words. As every great capital there are places and objects that are not “perfect”, but in my opinion this only makes city more interesting. hey thanks for this! i’m staying for a week here in Vilnius — actually really close to some of your Uzupis shots (heh as luck would have it, i actually even got dinner at the pizzeria you have pictured) and look forward to exploring more. i’m thinking of exploring some of the abandoned cold war sites around the country this weekend; hopefully they will be successful. Great photo’s Jon. I see you travel a bit more than just Vilnius ;)! Please share more if you see it fit. 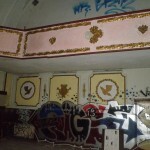 How have some of these abandon sites held up since you wrote this post? I am on a bus to Vilnius now and would love to explore the gems of the city.